ONESTRIKE is a first person, asymmetric Virtual Reality experience where a HTC Vive player utilizes patience, concentration, and the ability to slow down time in order to defend against and take out up to four PC players roaming the shadows by striking them with a sword. The PC players must devise a stealth operation to anticipate their targets actions and best strike the torso of the Vive player. I was brought on to One Strike for sound design and music composition. The Vive player's experience is deeply tied to using the player's own senses. The player uses their eyes, and more importantly, their hearing to detect the PC player's impending attack. This is easily done with basic spacial sound effects that most engines have, but I wanted to create an added element through procedural music. This project was developed in Unity v.5.5.0. 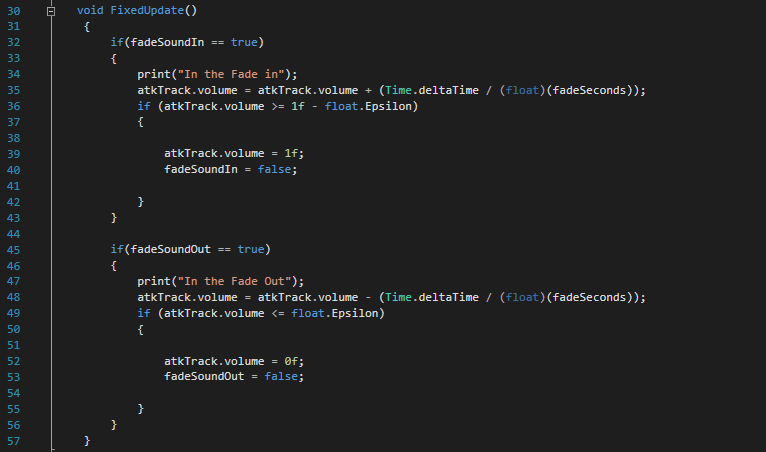 Here is the small C# script that I wrote to handle the fade functions of my procedural music. Our programmer, Matthew Cummings, opened my eyes to ​.Epsilon and it's made me rethink my life and how I've been handling float values. You live and you learn I suppose! Because the aesthetic of the environment is very sterile and basic, I went with a more atmospheric composition. There are two tracks that always play together. One track, the ambient melody, is a constant, played at it's native volume. The second track, played at a volume of 0, the percussion and Melody intensity, is directly tied to the PC player's proximity to the Vive player. When conditions are met that an attack is about to happen, the attack track volume fades up smoothly and recombines with the ambiance track to form the full music score. Like wise, if the attack event is dissipating, the attack track will fade down to 0. Listen to the full soundtrack of One Strike! One strike had a wonderful 3D modeler on board, Nicholas Hunter. The sword is definitely a showstopper. So much so that we have a running joke that we should rename the game to "Noah's Sword, The Game". We made a super sleek movie for the game's title screen, shown below. Composing the title music was effortless with such a beautiful sword as my inspiration. Follow us for development updates and news!